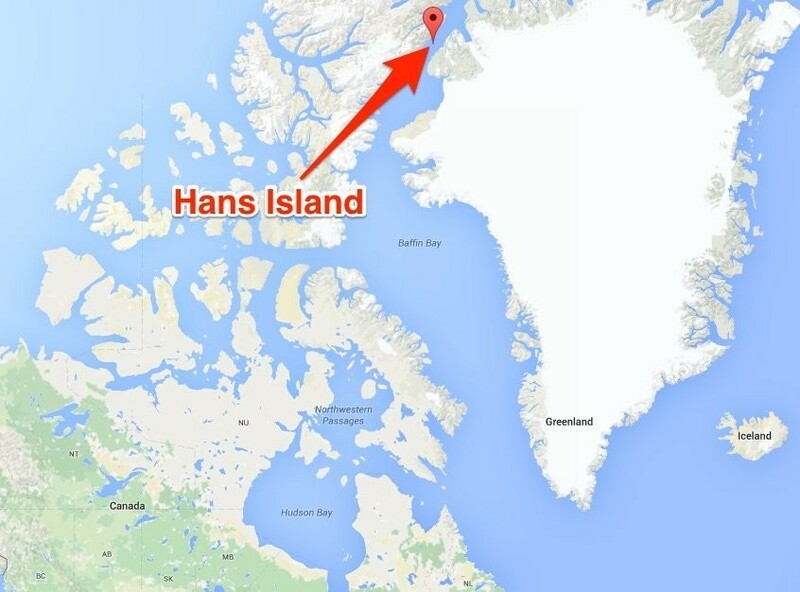 Hans Island separates Greenland, an autonomous territory of Denmark, from Canada. Far in the Arctic North lies the barren and desolate Hans Island. The uninhabited half-square-mile island, possessing no apparent natural resources, is a bizarre sliver of territory for two countries to fight over. However, since the early 1930s, this nondescript rock has been at the center of an ongoing disagreement between Canada and Denmark. According to World Atlas, Hans Island is located in the middle of the 22-mile wide Nares Strait, which separates Greenland, an autonomous territory of Denmark, from Canada. Due to international law, all countries have the right to claim territory within 12 miles of their shore. As such, Hans Island is technically located in both Danish and Canadian waters. World Atlas notes that the island was decided to be Danish territory by the Permanent Court of International Justice of the League of Nations in 1933. However, as the League of Nations fell apart in the 1930s and was then replaced by the United Nations, the ruling on the status of Hans Island carries little to no weight. The issue of Hans Island then loss traction in popular consciousness and the concerns of the Canadian and Danish governments throughout World War II and the heights of the Cold War, only to reemerge in 1984. On that year, Denmark's minister of Greenland affairs visited the island and planted a Danish flag. At the base of the flag, he left a note saying, "Welcome to the Danish island," along with a bottle of brandy, CBC reports. And since then, the two countries have waged a not-quite-serious "whiskey war" over Hans Island. Although the two countries have continued to disagree over the territorial status of the island, the governments have managed to continue the "whiskey war" and keep a good sense of humor over the incident. Peter Takso Jensen, the Danish Ambassador to the US, has said that "when Danish military go there, they leave a bottle of schnapps. And when [Canadian] military forces come there, they leave a bottle of Canadian Club and a sign saying, 'Welcome to Canada.'" Currently, a plan is in the works that could turn Hans Island into a shared territory that would be jointly managed by the Canadian and Danish municipalities bordering it.